When I heard that Colin Moock would come to Japan to make a talk in a seminar event sponsored by Adobe Systems Inc., it hit me that we could welcome and counter him with top ActionScript engineers in Japan! I'd like to show him the cutting-edge ActionScript techs developed in Japan, are not introduced yet to the world in English, unfortunately. 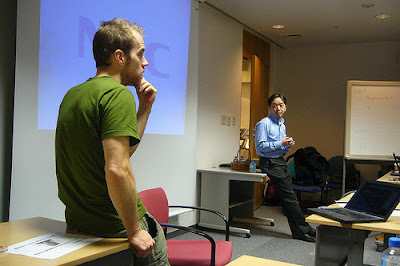 As the result, at the day of January 16, the Tokyo ActionScript Meetup 2008 F/ Colin Moock was taken a place in Adobe Japan. Very deep tech talks about ActionScript 2, 3 & also 4(!) were told. The last of all, I asked him some of questions invited by the audiences on ahead. I think the most of audiences including me would surprised that he could speak Japanese much fluently. We much enjoyed the session with you. Thank you, Colin! See you again! * The original longer post of this was written in Japanese.